Have you ever read a story where the setting makes as big an impression on you as the characters or the plot? Where the place of the story is as vital a cast member as the main character? One such novel is Daphne du Maurier’s Rebecca where the rambling beauty and luxury of Manderley and its grounds take precedence over the mousy, insignificant and never-named narrator, the second Mrs de Winter. Or The Far Pavilions where India during the Raj is displayed in mesmerising detail. These are rare novels where the place the story takes place is perfectly balanced with the rest of the components of the story, and combine being perfect backdrops with being almost an entity in their own right. Fantasy novels create entire worlds for the story to unfold onto, and Middle Earth springs to mind instantly, the Shire as home for hobbits especially contrasting with the ruinous splendour of Minas Tirith and the horror of the land of Mordor. I can’t count myself in the same league as any of these writers. I’m much smaller in scope and in vision. Much of both Strangers & Pilgrims and Away with the Fairies (see their separate pages at the top of the header if you’re curious) is set in small cottages, isolated from community and located in the English countryside. 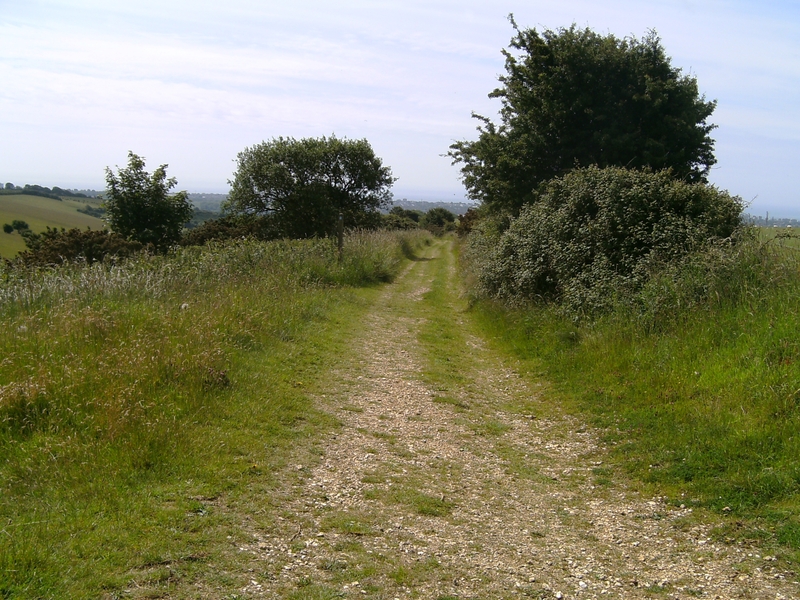 As Jean Raffa commented in her review of Strangers & Pilgrims, it’s quite clear how much I love the land I live in by the way I write about it. I can’t say I’m never going to write about an exotic far off land, but the balance of probability is that I won’t. Advice I was given as a teenager by a moderately famous writer was to write what you know about best. While imagination is a grand tool, I’m too limited as a person and as a writer to write solely from what my mind alone constructs and so places especially are always drawn from my personal experience. I’ve never once named the locations of stories, leaving readers to decide for themselves roughly where a book is set. I’ve also avoided intricate descriptions of interiors unless there is a good reason for doing so. That doesn’t mean I can’t myself visualise clearly what a place is like. I can. I’d just rather not bog down a reader in too much extraneous detail. I’ve written about two cottages (Isobel’s cottage, for those interested, appears in two more novels) in books already released, and there’s a third one to appear in a book later this year (I hope) but there’s a reason why I find the cottage such an appealing setting. It’s cosy and intimate and lends itself well to both intense dialogue and to introspection for the characters. It’s cut off in some way from the hustle and bustle of a community. It also has history and stability. Isobel’s cottage is old, and a little run down and lacking in modern amenities. It emphasises the time out aspect of her needs, and the isolation from everyday concerns. 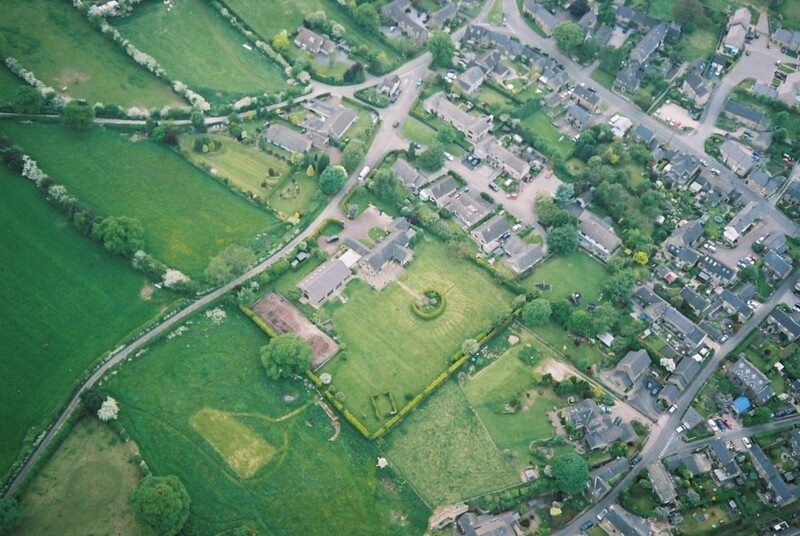 There’s also a few vicarages in my books. I’ve lived most of my adult life in one, though for the last five or so years, I’ve lived in an ordinary private home. Again, write what you know, but for many people what goes on inside a rectory, vicarage or manse is unknown and a little mysterious. There are pressures that most folks do not understand or imagine. Isobel’s experience is far from unusual and she copes better with it than I did. Her vicarage is a composite of the ones I have lived in or visited, and the constant barrage of phone calls etc is accurate to my experience of it. When they got into the old nursery, Jenny was speechless for all of a minute, staring round with amazed eyes. It was a huge room, the floor polished boards covered with another ancient but probably priceless Persian carpet, like something out of the Arabian Nights. One entire wall seemed to be tall windows with leaded panes, a radiator underneath. The original furnishings from Ashurst’s brief childhood here were still exactly as they had been then, more or less untouched since he’d left, asleep in his father’s arms after his brush with death he still didn’t remember. 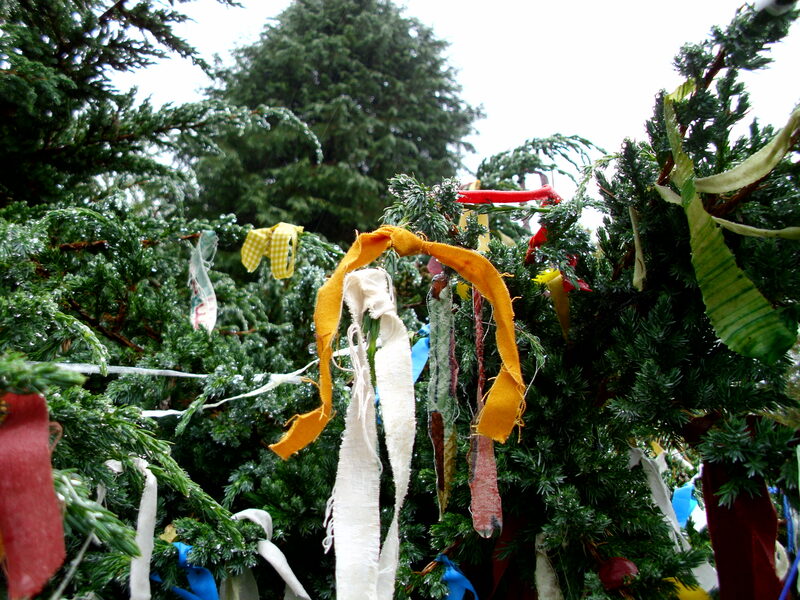 She went over to the carved crib, touching it in disbelief. 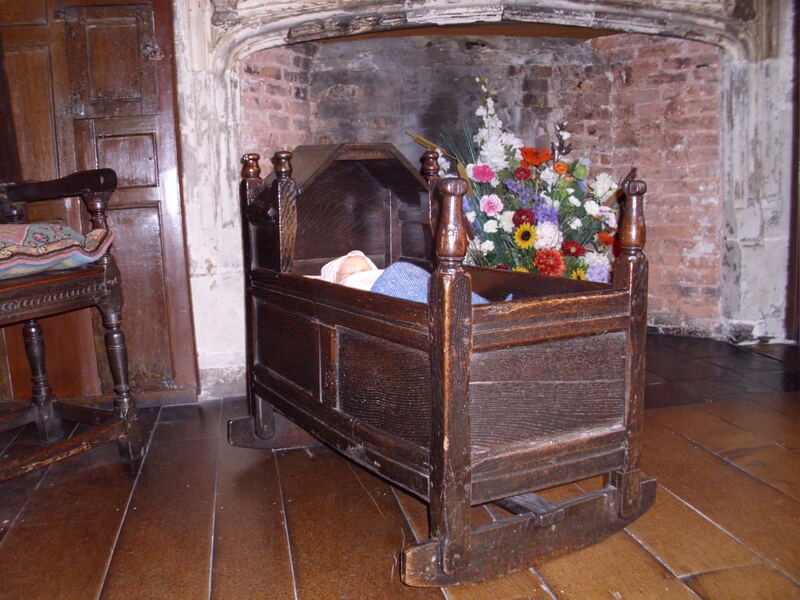 “This is practically medieval, this crib thing,” she said, running her hand along the smooth wood. During my life, I’ve visited many old houses and have made mental snapshots that I have stored in my memory to use as building blocks for images. Dreams only ever use things stored in the memory for their visual images, producing intricate composites of hundreds of details and the finished dream is a new product. It’s the same with settings for stories; we use hundreds of tiny details and create something new and unique. 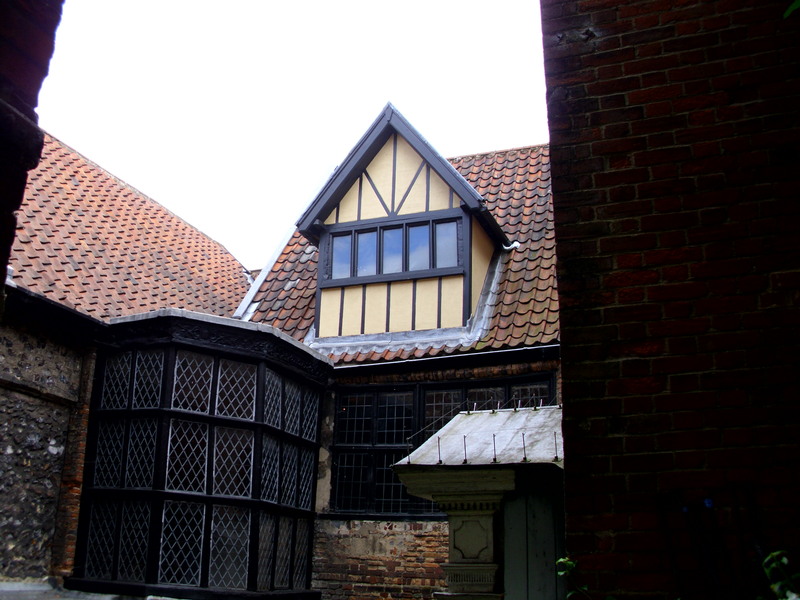 At the weekend, I visited Strangers’ Hall in Norwich and was struck by how similar the house is to the one in The Bet. 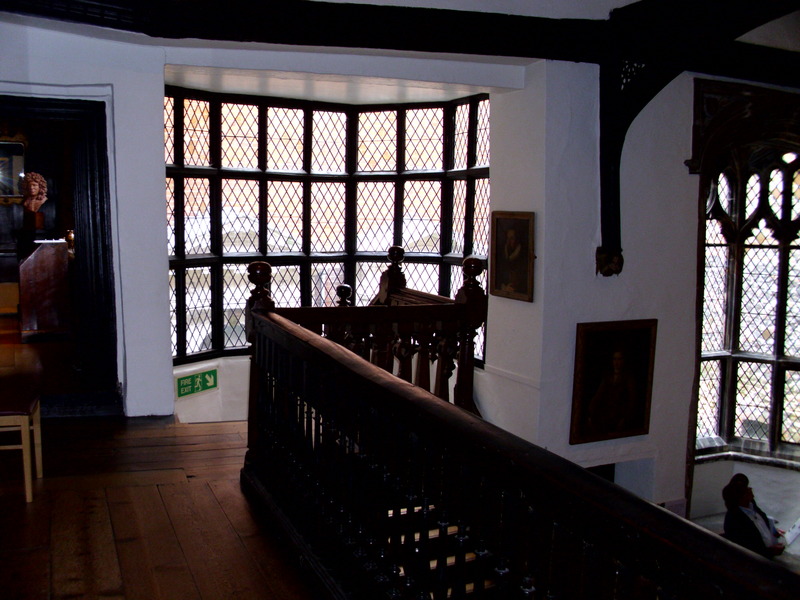 The Hall was first begun in medieval times, dating from the twelfth century and was added to and altered constantly. 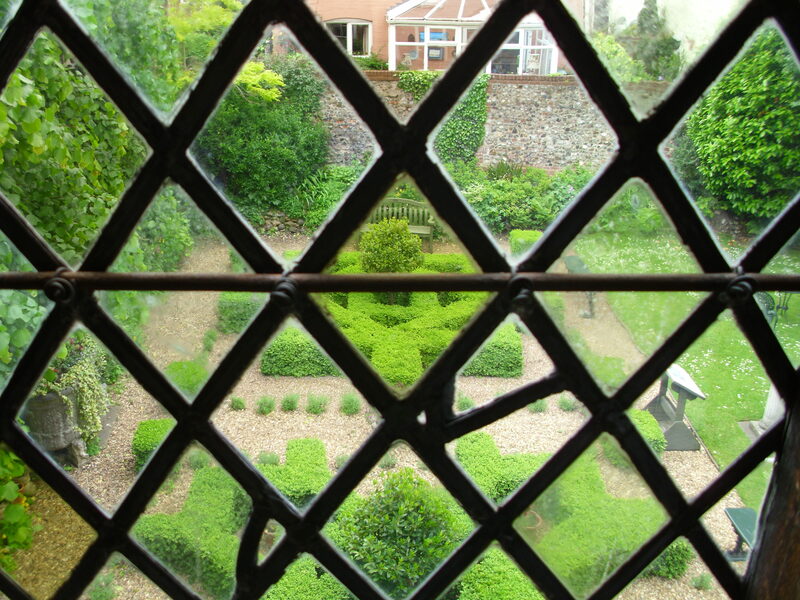 There’s a great hall, and leaded windows looking down on knot gardens. 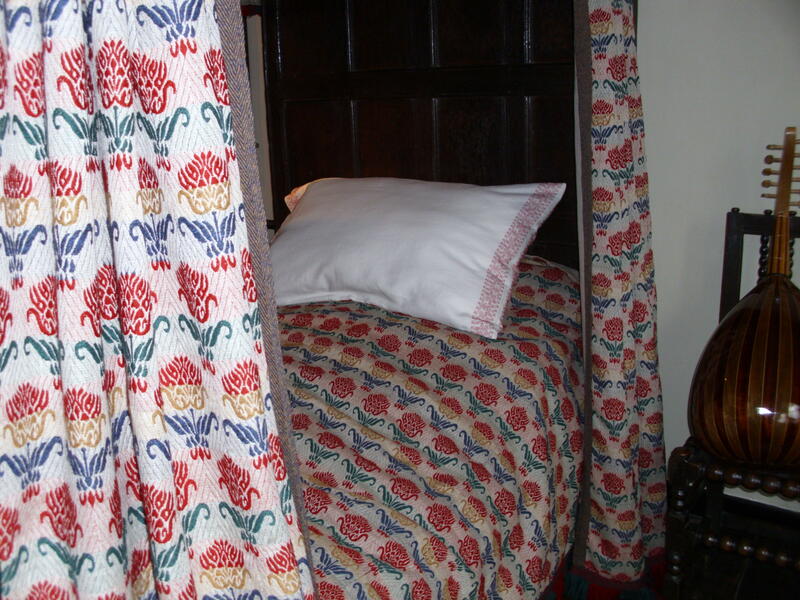 The biggest of the bedrooms on show is strikingly like the one in my story, down to the four poster bed with reproduction curtains. Of course, the reader doesn’t need to know every single detail. I talk about faded and worn Persian carpets but I don’t describe the colour or the pattern. I can see it in my mind. I don’t describe the layout of the house, but I know my way round. It’s a maze of rooms and corridors and little staircases, far too big for one lonely traumatised young man to live in alone. In the first chapters, he wanders constantly round from room to room, trying to find somewhere he can be at peace, and failing; I wandered with him, observing as he stumbled up steps, stood at doorways and stared into darkened rooms. The house in this story is integral to both the plot and the main characters but I hope that readers can construct their own mental version of it from what I chose to include. Constructing a setting for a story is a tough job, trying to balance between too much detail and not enough, but to achieve the goal of making that setting as haunting as the story is something I hope I have managed to do in all my stories. We’ll see later this year if I have managed to convey how much this house that has haunted me since I was about ten can haunt readers too. No, not a B movie….but rather a Bee movie if you prefer. Because the spring was a cold one and followed a winter with some extreme cold, everything in the UK has been late. Here on the East Coast, we’re finally getting all the hawthorn in full bloom weeks after it normally would have bloomed. Not only are the flowers late but the cold spring has held back the bees. As you may know, we’re bee-keepers. But what you might not realise is that most bee-keepers have their names down on something called the swarm register. This is a list kept of bee-keepers willing to come out and collect a swarm; local councils, police and many others access this list to find someone willing to come and deal with swarms. Now bees are amazing creatures in my opinion but not everyone agrees. People are understandably alarmed (or often terrified) by the arrival of what can be tens of thousands of bees. We’re on the local swarm register so we get called out. So far we’ve been called out a good few times. One swarm had settled itself in a chimney, inaccessible even with ladders. We left a bait hive for a few days but the bees liked their chimney and stayed there. Another swarm had picked the loft of a sheltered accomodation flat a few miles away; some found their way down into the bathroom. We reassured the occupants, made plans to come and collect when the bees were properly settled, but the bees moved on after a day or two. Then we had a swarm descend into a spare hive we had in the garden. We only discovered this later in the day when we went to try and take a spare frame from it to be greeted by annoyed bees. 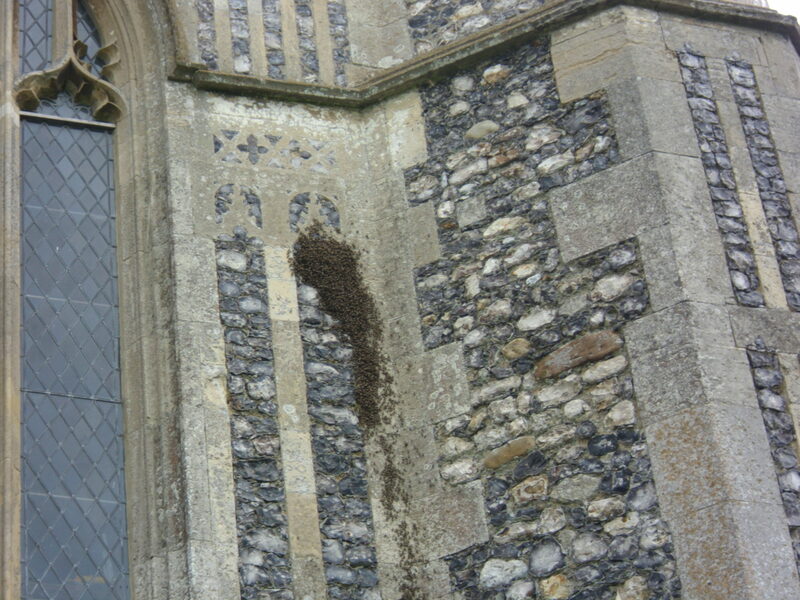 But so far I had never SEEN a swarm, just the outliers coming and going from whatever nook they’d settled in. This was an amazing thing to see and has enormous significance for us. I’m scared of heights. Really scared, actually. It’s not logical at all but it’s powerful and paralysing at times. It’s not so much a conscious fear but more an experiential one. There are sensations I experience when in high places that are very unpleasant. Vertigo and nausea for a start. Sweating. Shaking. It’s not a pretty picture at all. Two years ago, I was forced to confront the fear at work. I work as a courier/tour guide for my second job, and I take groups of English kids to Europe for educational visits. I’m the one on the in-coach microphone, giving a commentary about wherever we are. 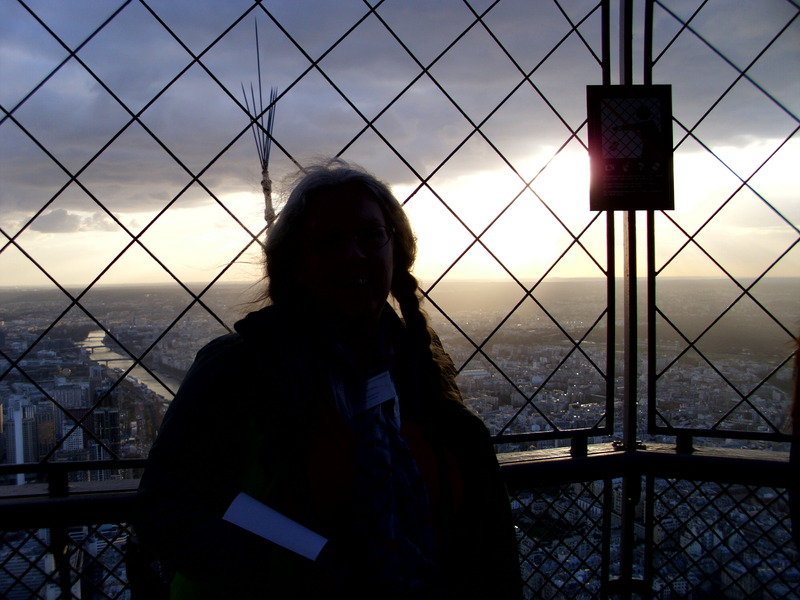 No trip to Paris is complete without a trip UP the Eiffel Tower, but until two years ago, I’d somehow managed to be the responsible adult who stayed on the ground with the couple of kids who didn’t feel they could go up. Two years ago I did a trip where the teacher in charge deemed that EVERY kid had to go up, whether they were scared or not, so I had no option. I went up, shaking and sweating, on the very brink of a panic attack the whole time. But I stayed in the enclosed capsule at the final stage and didn’t climb the final dozen stairs to the highest point the public can visit. I was unable to set a foot on that iron stairway and make it up. Last week, I took a group who have so far never gone to the top. It’s always been closed for maintenance when the group usually visit Paris. Last year we went to the second floor. When we got there this time to change to the smallest lift, one child became so unwell with fear, a member of staff had to take him back down. So the die was cast and I knew I had to go to the top again. The final lift is quite small compared to the first one which holds about fifty people so my group and I packed in and held on. I shut my eyes. Stepping out, I was relieved to be there but knew going down is worse. The kids wanted to go to the final stage and I had no choice but to go as well. Reaching the circular gallery at the very top, I felt the full force of vertigo hit me, and I tried to dig my fingernails into the metal walls. Breathe. Just breathe. After a moment or two, I was able to steady myself and move, walking slowly and shakily round before descending again once another member of staff was present. A kind American girl took my photo so I have evidence that I finally made it to the top. Many things in life are like this. The tip-top is so far away, we think we can never reach it, it’s like shooting for the stars. But if you break down a massive task into discrete, achievable chunks, each to stand alone as a powerful monument to your abilities, then you have an option of building on them and slowly but surely reaching the top. After all, there’s only one way to eat an elephant: bit by bit. To those you have lost. And cuts more than you know. In the winds of passing time. Time wears the fabric down. Of what there truly was. That time will bring you. Not like a bird but rather a kite. And bound to earth by boots of lead. By choice or chance to free my flight? Until I slip into the dream once more. The Sea-gull’s Tale ~ knowing when or if to intervene. sport in splatting on cars or people. I have great admiration for all of these loathed creatures because they survive on the fringes of our lives and in some cases, share space with us. is loud and often violent. omnivores, devouring the dead of their own and other species. I witnessed such an attack from my classroom the other week, where twoadults mercilessly stabbed their beaks at a youngster, ripping feathers from his head. I don’t know if the chick was theirs or not, but they wanted nothing to do with it and I feared they would kill it. air full of the raucous cries. Today my boss came to find me in the staffroom, summoning me to the front because there was a sick bird. Don’t ask how I’ve ended up being the Florence Nightinggale of the animal world in the eyes of the people I work with, but it would seem that I am the one who gets called if there’s something needing to be done with a living being other than a human. Outside, among the throngs of students (who reminded me of the gulls at that point) I was directed to a corner where a juvenile gull huddled. 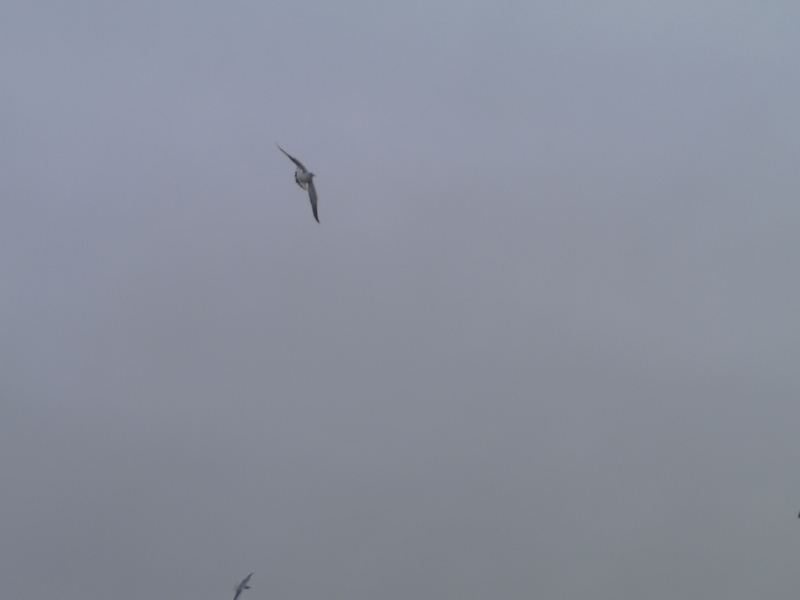 It was the same young gull, a wound on the side of his head. I called him closer so I could see the extent of his injuries. He came to a foot or two away and let me look before scuttling away. The wound was healing, as far as I could see. But short of somehow grabbing him and subjecting him to first aid, I could do no more. The RSPCA would do nothing as a gull is a common bird and considered vermin by many. I couldn’t catch the bird and just kill him; he had a chance of making it if he stayed away from his own kind till he grew stronger. sadness that I had no power to help. I gave my verdict that there was nothing to be done and the bird would probably be fine, and the kids seemed reassured by this, but I felt I had somehow failed. There are times when you can help in a situation and there are times when any help you may give will create a worse situation, and right now, I simply do not know if I am doing the right thing in doing nothing. And yet, my instinct is that when compassion is evoked, then intervention is both right but also inevitable. I’m not a teacher, as such, and I have nothing to teach you. But we might learn together. inspire you to ask some of your own. I’m not enlightened; I can make no claim to such a thing being sometimes so lost in my own internal darkness that I extinguish my own small light while thrashing around. But sometimes that tiny pearl of light might be enough to guide a soul home. I’m not awakened; I live in that shadowy penumbra of the world between worlds, caught in the trailing edge of dreams. But sometimes we may be dreaming the same dream and can compare notes. carry mine for me while I am weak. forge. One day I may be a worthwhile tool but not yet. than for the poor soul who makes them. not use those gifts as well as I might in a perfect world. I’m no angel, but I may be a messenger. I stand with one foot in either world, amphibious, between the world of the soul and the world of the body, never quite sure from one moment to the next where the messages are coming from. I’m not a leader. No one should follow me where I am going, but I would welcome the company if anyone is going the same way. Sometimes we all need a hand to hold in the darkness.